High School Math based on the topics required for the Regents Exam conducted by NYSED. How to Find an Angle Using Alternate Exterior Angles? 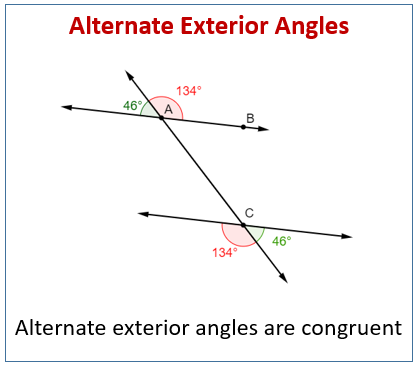 The following diagram shows some examples of alternate exterior angles. Scroll down the page for more examples and solutions. Alternate exterior angles are formed by a transversal intersecting two parallel lines . They are located "outside" the two parallel lines but on opposite sides of the transversal, creating two pairs (four total angles) of alternate exterior angles. Alternate exterior angles are congruent, meaning they have equal measure. How to Find an Angle Using Alternate Exterior Angles?